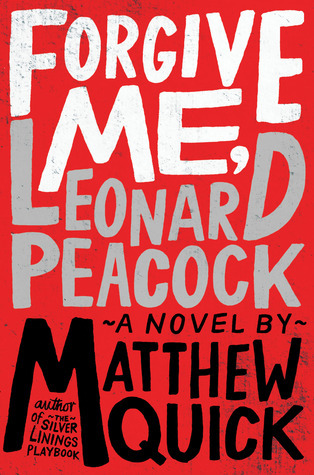 FORGIVE ME, LEONARD PEACOCK is arguably one of the most explosive and important books of this year, but if you knew nothing about Matthew Quick, most famously the author of Silver Linings Playbook, you probably wouldn't expect it. Which would be a shame on your part. It was almost that way for me. In the beginning, I was rather unimpressed by Leonard as narrator. He seemed to come off as just another socially awkward teenager trying to hard to be nonchalant. But, like a hypnotist, his reasoning for why he was going to kill himself--his cool-headed explanations for why it was absurd to keep on living just to be just another blank-faced automaton adult in the rat race--snake-charmed its way into my head, until I found myself nodding along and thinking, "Oh man. This guy is absolutely right. What is the big deal about living when most adults are so unhappy? Why haven't I killed myself yet?" You see, that is the power of this book. Its main character has a goal that we'd never condone, and yet it's not at all difficult for us to understand where he's coming from. Leonard Peacock is a totally convincing potential murder-suicide. That's why I feel like this book is so important: it's one of the most convincing looks inside the mindset of the ones behind the recent troubling trend of teenage killings. Cover discussion: I normally don't really like text-art covers, but this one.... I mean, there is no way to adequately describe the experience you will get from reading this book, so I don't even care one way or another what's on the outside. e-galley provided by publisher and NetGalley. Thank you! I agree that the book gets so well into that mindset, and it's weird how Leonard's reasoning starts to seem reasonable. I've seen this book around, but never really looked at it to see what it was about. It sounds powerful, and like you said, important. Adding it to my TBR. It IS a shame on my part. One I plan to rectify ASAP. I've seen this book around too, but I always brushed past it. that needs to change. Wow. I love that even with the brevity of your review, you make this book sounds like it packs quite the punch! I might just have to check it out for myself.